JOLIET, Ill., Sunday, Sept. 8, 2002 - In yet another finish determined by inches, Sam Hornish Jr. won the Delphi Indy 300 in the closest finish in IndyCar Series history, edging Al Unser Jr. by .0024 of a second at Chicagoland Speedway. The win gave Hornish a 12-point lead in the standings over Helio Castroneves, who finished fourth, entering the season-ending Chevy 500 at Texas Motor Speedway. 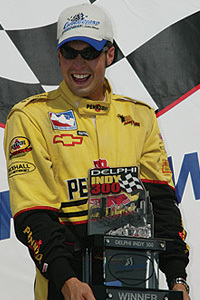 It was Hornish's fourth victory of the season, tying an IndyCar Series record. "I'm sure it will be tough, and it will be a long run next Sunday," Hornish said of the season finale at Texas. Hornish, who started from the pole, averaged 146.319 mph in a race slowed five times for 57 laps by caution periods. He earned $126,600 for his seventh career IRL victory. Buddy Lazier finished third in the No. 91 Coors Light/car, with Castroneves fourth in the No. 3 machine and Eddie Cheever Jr. rounding out the top five. Just .9387 of a second separated the top 10 cars at one of the most exciting races in history. "We were just running wheel-to-wheel, as close as you could get," Lazier said. "It was a lot of fun out there, but it sure was hair-raising. You really have to trust everyone you race with." Defending series champion Hornish and two-time Indianapolis 500 winner Unser raced side by side the last 21 laps of the 200-lap race. The gap between them was smaller than two-tenths of a second during those final 31.5 miles of racing, and the lead was smaller than a tenth over the last seven laps. During that thrilling final chase, Unser maintained a low line in his car, while Hornish stayed high in his No. 4 Chevy. Meanwhile, another eight drivers raced behind them side by side over the last 20 laps, turning the front pack into nearly a 220-mph pace lap with incredibly high stakes and unnerving tension. Neither Unser nor Hornish gained any advantage over the final five laps, and Hornish's winning margin was almost indistinguishable to the naked eye at the finish. Unser was on the short end of the closest finish in IRL history for the second time this season, as Jeff Ward edged him by .0111 of a second in June at Texas. "I tell you, they don't come any closer than that," Unser said. "I thought I had him. Congratulations to Sam Hornish Jr. He and the whole Pennzoil team did a great job. It was exciting. We were able to get underneath him, and I was motioning to him to get in line, which he motioned to me to get in line, and I did. I wanted him to do the same, but it was to no avail." Said Hornish: "I've got a lot of respect for Al and all the things he's done. Running beside someone who's as experienced as he is, and that I have as much trust in, is just like a high-speed pace lap, pretty much." Hornish leads second place Castroneves, 481-469, with de Ferran third at 443. The set Hornish and Castroneves up for a championship duel at Texas that nobody would soon forget. Castroneves started 21st, his worst of the season. But he wasted little time moving toward the front, helped by crafty driving and fast pit work by Marlboro Team Penske. Two-time Indianapolis 500 winner Castroneves climbed to third by Lap 55. Castroneves took the lead for the first and only time in the race on Lap 159 after a fast pit stop. Unser passed Castroneves for first on Lap 167. Then Unser and Hornish began their 220-mph game of chicken. They exchanged the lead nine times in 27 laps between Laps 169 and 195, often by inches. Hornish finally took the lead for good at the line by inches on Lap 195, with that gap holding steady over the final laps.